The property is a Victorian mid-terrace house located in Lewisham, South London. The renovation work included a single storey rear extension and side return with a depth of 6 meters from the original rear wall. Model Projects were able to create an open-plan kitchen, dining and family area, that was full of natural daylight. The design team achieved this through the use of tall bifold doors and a fixed glazed roof panel to the side return. Underfloor heating was provided to keep the kitchen warm during inclement weather. A London stock brick feature wall was designed to allow different zones to be created within the ground floor area. A family snug/playroom was created providing views over the garden. The living room was redecorated. The existing gas fire was reinstated with the original fireplace surround and hearth being updated. The first floor bathroom was renovated. The main element of the design was to blend the new extension in with the original house. Model Projects achieved this through the use of a light coloured pitched form, flanked on either side with traditional London stock bricks, along the two party walls. Two downpipes inside of these walls enhance the symmetry and balance of the design. Central to the rear elevation is a set of large bi-folding doors, which allowed more light to flood into the new kitchen and living space. This enhances a sense of openness and connection to the outside. A light grey crafted Shaker-style kitchen is located to the middle of the property with a central island. A range cooker is located within the original chimney stack. A marble worktop and butler sink, along with pendant lights add unique design features to the kitchen. 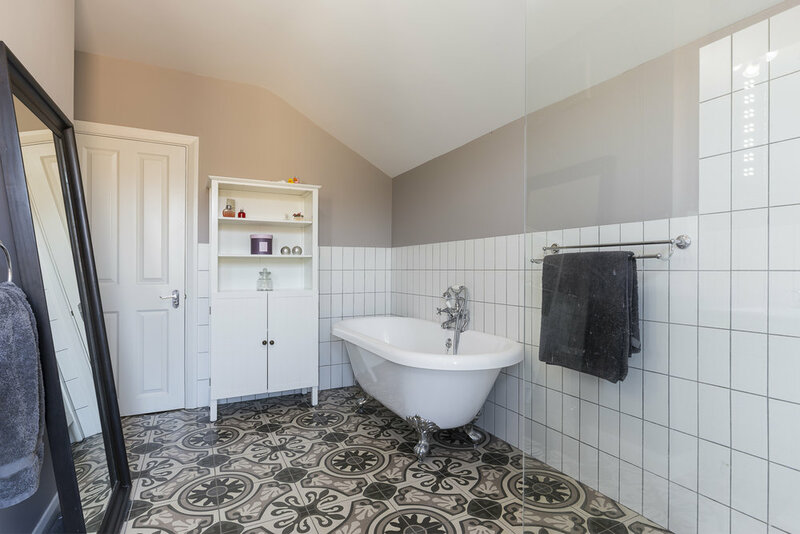 The first floor bathroom was upgraded, providing a classic bath with modern shower fittings. It was decorated in keeping with the Victorian features of the house. 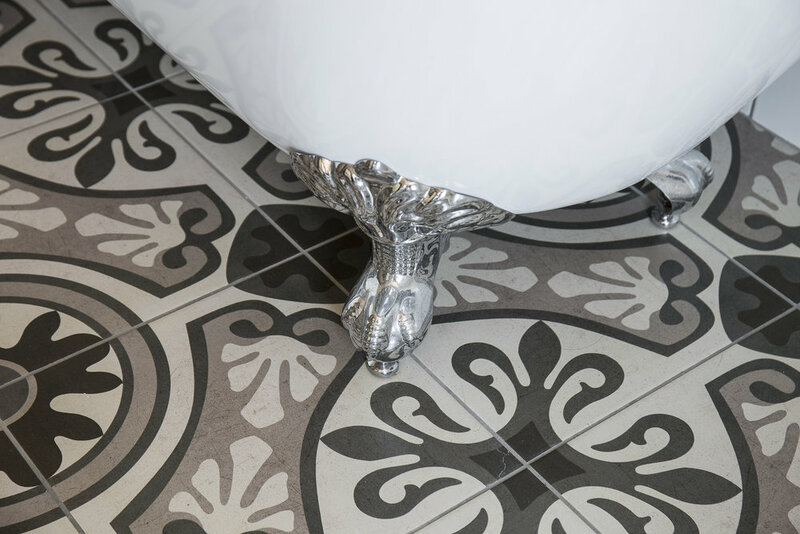 The pattern floor tiles add a design twist to the clean lined bathroom design. The overgrown garden has been landscaped into a beautiful urban garden, with a terraced area, gravel, planting and a useful garden shed located at the end. MODEL Projects’ Stage 1 Creation Pack was the perfect way for us to assess our potential home renovation. We purchased our first house last year and our main aim was to turn it into our home. After seeing some of the images which MODEL Projects posted on Houzz from previous projects, and meeting the team at the Build It Live show in Bluewater, we were impressed with the passionate team, who are all clearly committed to what they do. They have been fun to work with and not afraid to challenge us when they think we are taking a wrong turn. The clear, simple, well articulated approach with defined and well structured deliverables at each stage set the team apart from their competitors. The process allows us to develop the project at our own pace, whilst maintaining momentum. Their management of the supporting services, such as party wall issues is helpful for us as we have very demanding and busy jobs. In taking the stress away from the process, it has allowed us to focus our energies on the parts of our new home which matter to us the most, like the kitchen design and finishes. We look forward to taking the design to the next stage. Model Projects decided to utilise the property’s Permitted Development Rights, and due to the depth of the extension being over 3 meters a prior notification was required. 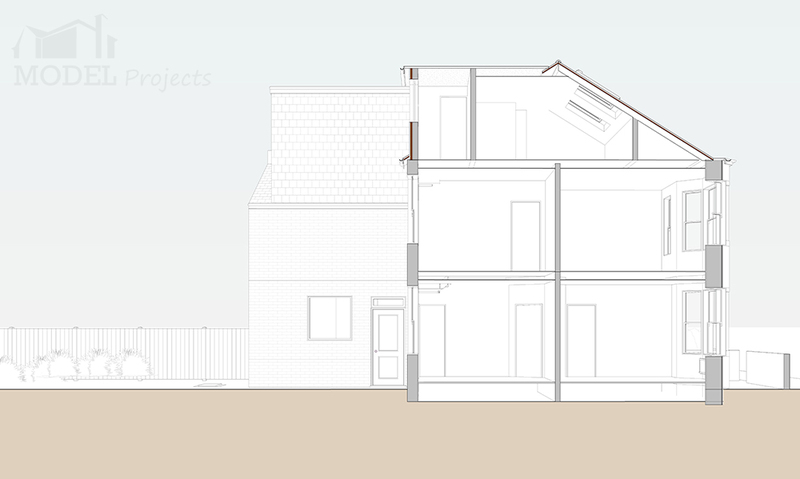 An application for planning was submitted through a Certificate of Lawfulness for both the rear extension and loft conversion with approval being granted. Permission for the ground floor, single storey, rear extension was gained under Class A - enlargement, improvement or alteration under the property’s Permitted Development. The side return and extension increased the property’s size from 115m2 to 129m2.